One of the favorite food sites to which I subscribe is Citron & Vanille — the recipes are always interesting and delicious, but sometimes the products are difficult to source, and the preparation can be extensive. Case in point, her recipe for Saumon en Feuilles de Blettes, Puree de Chou-fleur, Fondue de Legumes et Jus d’Estragon. I know it would be exquisite in its entirety, but I can’t manufacture the time this evening. 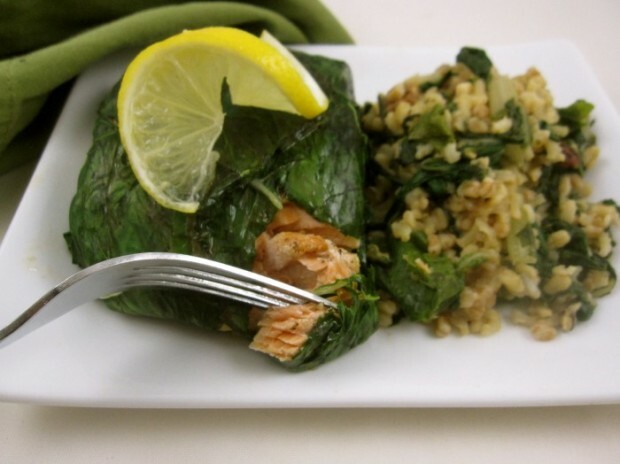 I can, however, carve out the centerpiece — salmon wrapped in chard — and pair it with a quick side. I divided the recipe in half — Richard and I are dining alone. I only required 2 large chard leaves, so I cut the remaining bunch of chard into ribbons, which I incorporated into a box of Far East Roasted Pecan and Garlic Whole Grain Blend. Sear & season salmon, wrap in chard and bake. 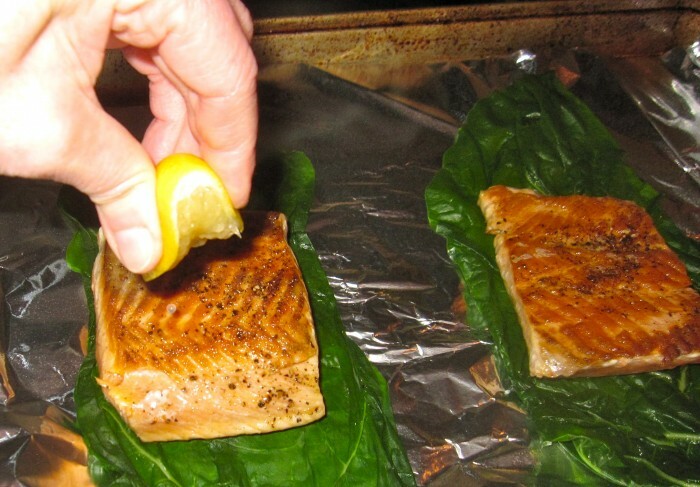 Everyday salmon gets a refreshing makeover when wrapped in large blanched chard leaves, and I encourage you to try it. This is a recipe I will absolutely make again — perhaps experimenting with a different fish fillet. If you’ve the time to recreate the entire recipe, I’m signing off jealous! Bring a large pot of salted water to a boil and blanch chard leaves until softened, no more than a minute or it will fall apart. (You may want to blanch the entire bunch and use as a side dish – see above notes.) Drain and run under cold water; pat dry. 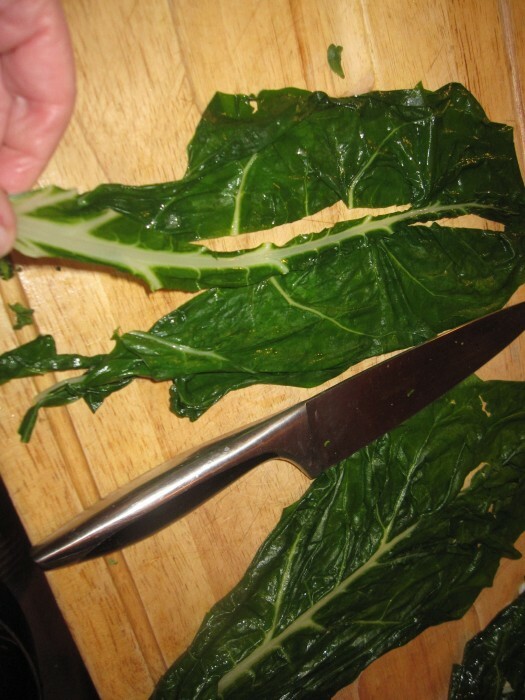 With a sharp knife, cut out the hard, center vein from each chard leaf; you will be left with four panels. With a sharp knife, cut off skin from each salmon fillet and season with kosher salt, freshly ground pepper and lemon juice. In a saute pan large enough to accommodate fillets, heat oil to high heat. Sear fillets, without jiggling pan, 2-3 minutes on each side or until golden brown but undercooked in the center. Arrange 4 chard panels, lengthwise, on an oil lined baking sheet or piece of parchment paper. Center each fillet on top of 2 panels and wrap each fillet with chard. Drizzle with olive oil and bake on center rack of oven 5-10 minutes, depending on thickness of fillet and desired level of doneness. 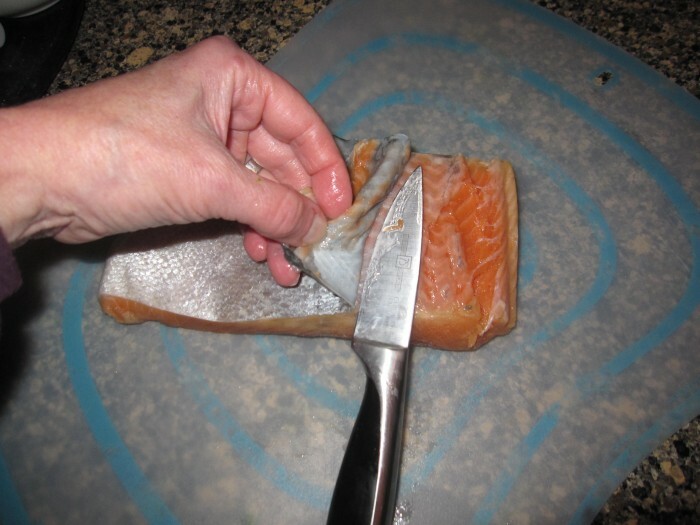 Then, wrap carefully the salmon with the the chard panels. Hi Poohbah – I’m used to seeing you on the newspaper blog! Thanks for the comment and I made the correction. Happy New Year!